Whole Foods Market held a Hawaiian blessing yesterday to formalize a move seven years in the making -- the start of work on what will be the natural-foods chain's first Hawaii store. Buildout was slated to begin yesterday on the more than 26,000-square-foot space once occupied by Star Market at Kahala Mall. The projected opening is spring 2008. 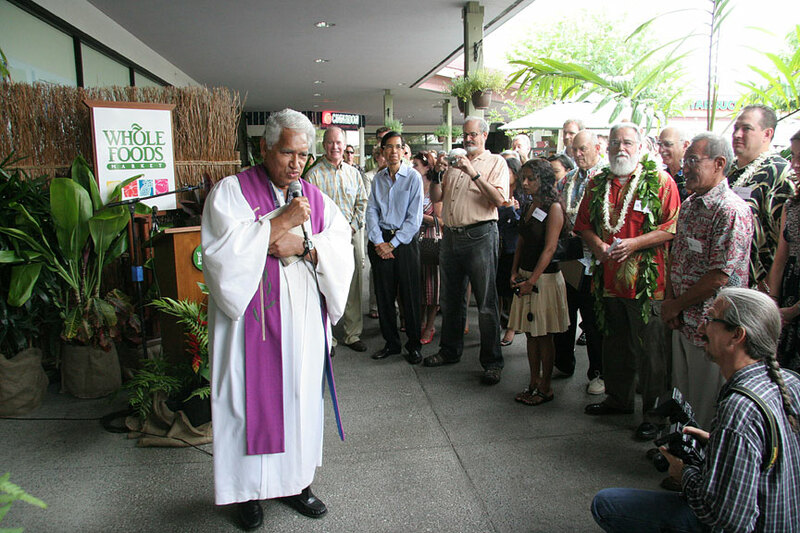 Michael Besancon, president of the southern Pacific region of Whole Foods Market, said yesterday's blessing is the culmination of a seven-year effort to enter the Hawaii market. Local farmers and food producers interested in working with Whole Foods Market can contact Erica Dubreuil at erica.dubreuil@wholefoods.com. "It's been seven years of building relationships," Besancon told the Star-Bulletin. "Rather than walking in without knowing a soul, we've been developing these relationships." No vendors have actually signed contracts yet. But the Austin, Texas-based natural grocer, however, is well into its search for local products to showcase. The new store will include a large wine department, in addition to fresh-baked breads, sushi, tempura, Korean BBQ, yakitori, organic sake and bottled beers. Besides wine, artisanal cheeses and eco-chic apparel, the store will also offer free wireless Internet access. Whole Foods carries some of its own brands, including 365 Everyday Value, 365 Organic Everyday Value, Whole Kitchen and Whole Pantry. The Kahala store will be similar in size and format to the chain's outlet in Palo Alto, Calif., which was its first on the West Coast. 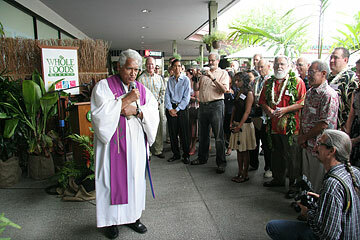 He said Whole Foods will also consider selling poi and poke, which it already sells in its mainland stores. He said he didn't know what percentage of produce at the store would be local yet, but said Whole Foods will push to have as much as possible. However, consumers must also be aware that they will pay a higher price for organic, locally grown produce. Whole Foods, founded in 1980, holds a stance against genetically modified organisms, or biotech-engineered crops, as well as cruelty against animals. Though it has come under scrutiny and criticism by those in the natural foods industry, its philosophy is to support sustainable agriculture. Gary Maunakea-Forth of MA'O Organic Farms -- a nonprofit managed by youth in Waianae -- said the arrival of Whole Foods may pave the way for more growth in organic farming in Hawaii, which is currently limited by availability of land. "Whole Foods Market is well known for being tremendously supportive of local growers, and we are so pleased to have them come to Hawaii," he said. "This will be a great opportunity for all of Hawaii's farmers." Besancon said the Whole Foods store at Kahala will open first, followed by the one at the former Ward Village Shops site, where construction has been delayed by the discovery of native Hawaiian remains. Whole Foods is also searching for other sites, which is likely to include another one on Oahu as well as stores on Maui and possibly, the Big Island. Jeff Biddle, produce coordinator for Whole Foods, said the company will look to Hawaii's chefs for some ideas of what to feature in the store. "Chefs help because they're always on the cutting edge," said Biddle, adding that Whole Foods will be looking for the highest quality fruits and vegetables it can find. "We emphasize organic, and we emphasize local." Whole Foods plans to hire about 150 for its smaller store, and up to 400 for its larger-format stores. The company is on a fast track to expansion, with 25 more stores expected to open in the southern Pacific region in the near future. In fiscal year 2006, Whole Foods pulled in $5.6 billion in sales. It has close to 200 stores in the U.S., Canada and United Kingdom.